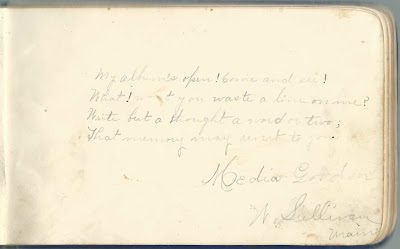 1880s-1936 autograph album of Almeda (Cook) Gordon, "Media", of Steuben, Maine, and West Sullivan, Maine, before and after her 1887 marriage to Ernest Clifford Gordon. The album measures approximately 7" by 4-1/4" and contains the sentiments of 36 of Media's relatives and friends. An alphabetical surname list and an alphabetical list of the inscribers, together with any personal information they offered, appear at the end of this post. Almeda Cook, "Media", was born November 26, 1869 at Steuben, Maine, the daughter of George S. Cook and Malinda Jane (Lambert) Cook, who, I believe, were born in Maine and New Brunswick, respectively, though some Censuses listing them switch Maine/New Brunswick up. Many people from the border area moved back and forth; were residents of New Brunswick islands who were delivered by an Eastport, Maine, doctor; and considered the border a botheration. 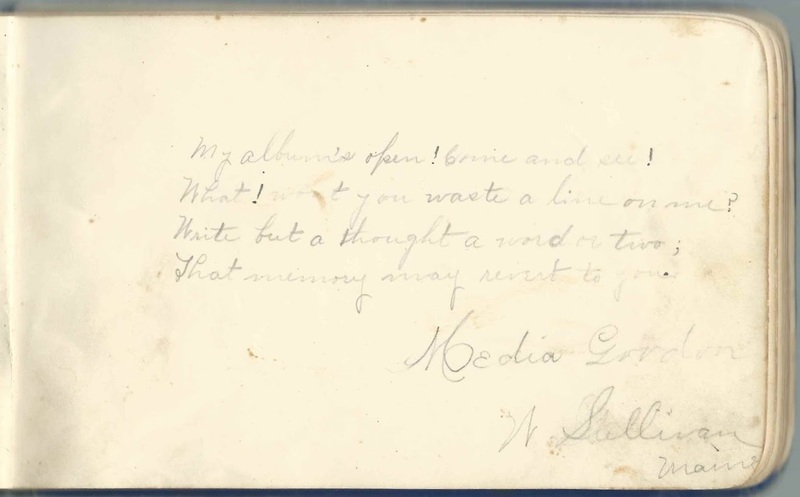 Among Media's relatives to inscribe pages in the album was her mother, Malinda Jane (Lambert) Cook. About December 1887, Media married Ernest Clifford Gordon, son of Amaziah and Sarah J. (Badger) Gordon. 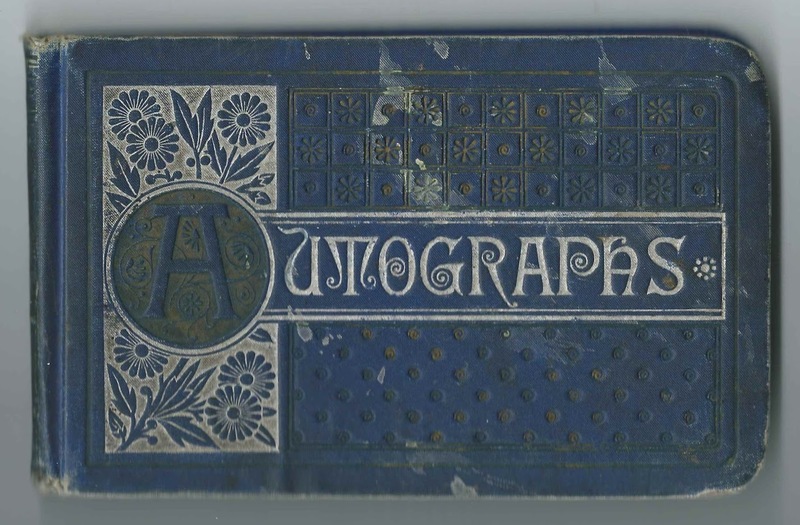 Before their marriage, Ernest inscribed a page in Media's album; he updated the page in 1903. Media and Ernest had two daughters, Lela Blanch Gordon and Mona Elaine Gordon. 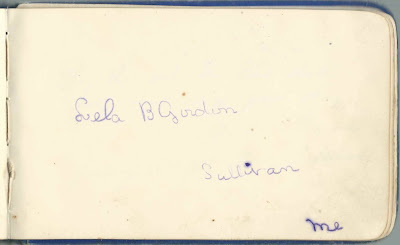 Lela inscribed two pages in her mother's album, before her marriage to Earl Ross Jellison. 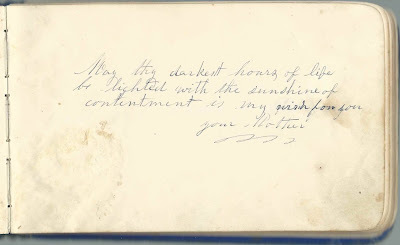 The later sentiments in the album were left by Lela's daughters Barbara E. Jellison and Norma Lee Jellison. Hellen E. Bla? of Franklin, Maine, inscribed on July 4, 1886. Surname could be Blais or Blaisdell or ?
? D. Burke of West Sullivan, Maine, inscribed on March 27, 1885. First initial could be Z or G or ? Almeda "Media" (Cook) Gordon of West Sullivan, Maine; album owner Almeda D. (Cook) Gordon, wife of Ernest Clifford Gordon. E. C. Gordon, inscribed twice, first on April 12, 1885; second, on July 19, 1903. Media's husband Ernest Clifford Gordon, inscribed before and after their marriage of 1887. 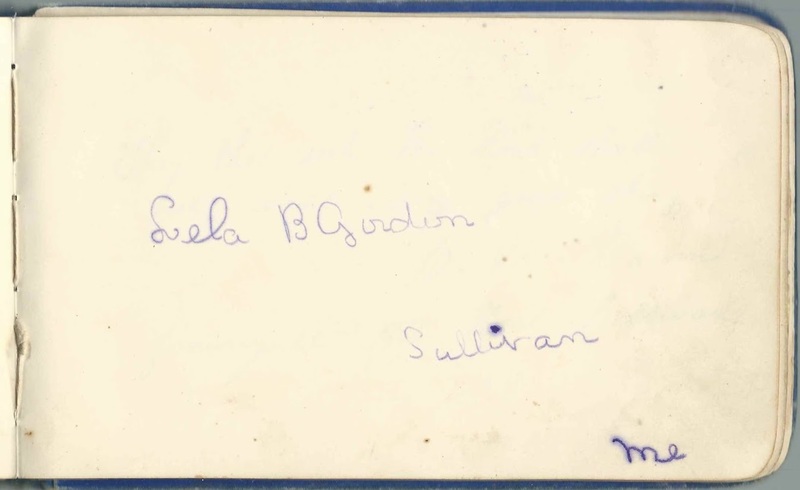 Clara Gordon of West Sullivan, Maine, inscribed on April 16, 1885. Clara Belle Gordon, sister of Media's future husband Ernest Clifford Gordon. Van Buren Gordon of West Sullivan, Maine, inscribed on September 6, 1885. 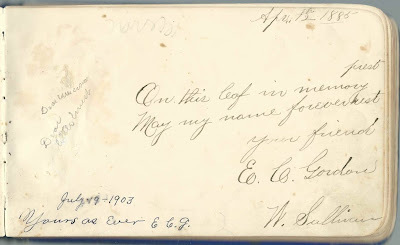 John Van Buren Gordon, uncle of Media's future husband Ernest Clifford Gordon; his wife Ida Annie (Hooper) Gordon inscribed the right facing page. Mrs. Ida A. Gordon, inscribed at West Sullivan, Maine, on September 1, 1885. "Never forget your little friends Delly and Queenie". 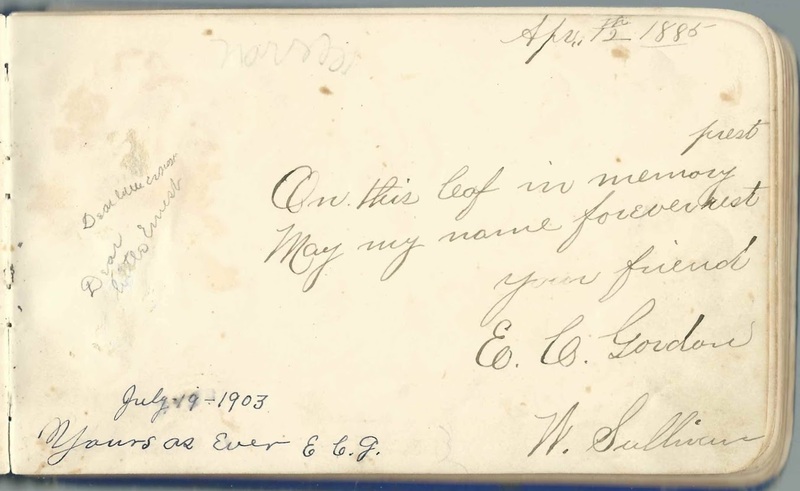 She was Ida Annie (Hooper) Gordon, whose husband John Van Buren Gordon inscribed the left facing page. Norma Lee Jellison, grade 6, Media's granddaughter, daughter of Lela Blanch (Gordon) Jellison and Earl Ross Jellison. Barbara Jellison, Grade IV, March 2, 1932; Media's granddaughter, daughter of Lela Blanch (Gordon) Jellison and Earl Ross Jellison. Norma Lee Jellison, inscribed on March 27, 1932; Media's granddaughter, daughter of Lela Blanch (Gordon) Jellison and Earl Ross Jellison. Barbara, "your loving Grandchild", inscribed on November 25, 1936, at age 13. Barbara E. Jellison, daughter of Media's daughter Lela Blanch (Gordon) Jellison and Earl Ross Jellison. 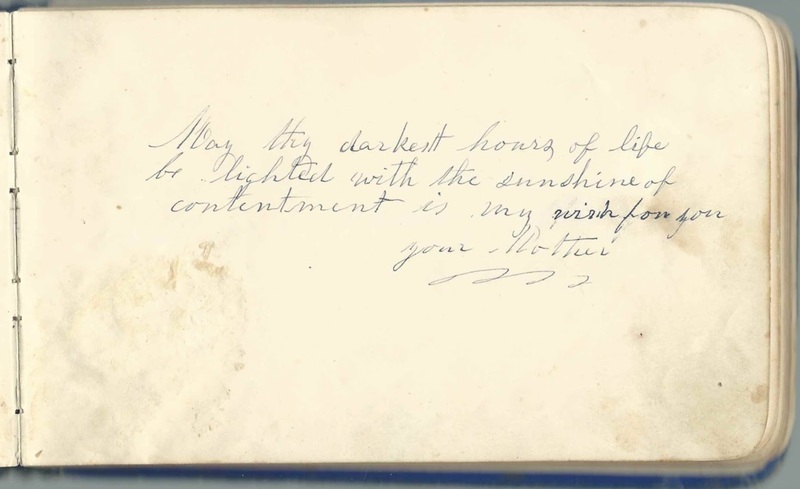 A. W. Woodman of Eastport, Maine, inscribed at Milbridge, Maine, on January 19, 1884. Presumably Arthur W. Woodman. 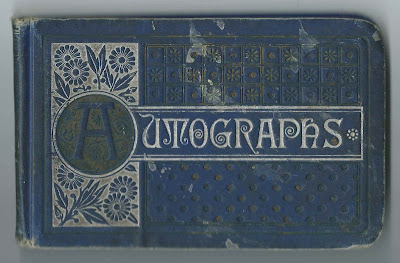 His wife Georgietta (Hutchins) Woodman inscribed the right facing page. Georgietta Woodman, inscribed at Milbridge, Maine, on January 19, 1884. Georgietta (Hutchins) Woodman, wife of signer Arthur W. Woodman, who inscribed the left facing page.